LA FURA DELS BAUS. Marcel·li Antunez Roca. In the eighties he was a key figure in the performance art ensemble La Fura dels Baus. Marcel·lí was a founding member of the collective La Fura from its beginnings in 1979 until 1989. He participated as a performer, musician and artistic coordinator in the performances Accions (1984), Suz /o / Suz (1985) and Tier Mon (1988). These three shows launched the group on the international circuit and led to their becoming one of the world's most acclaimed contemporary performance groups. The Trilogy, as these shows were called, were a radical manifesto of the group's style. These performances are characterized by the lack of words, the fusion of action and music and by the visual impact produced when fleeting events, mechanical contraptions and the bodies of the performers are melded into a raw, beautiful and violent poetry. However, perhaps the most significant identifying mark of these performances was the fact that the action took place in the same space as the audience. The awestruck crowd were obliged to mill and participate in the event. Marcel.li's time spent in the Fura is significant because the performances of that period can be seen as an intrinsic part of his work. A founding member of the Fura, along with Pera Tantinya and Carlos Padrisa, the Fura's first notable happening was a tour with a cart and mule during the months of August, September and October in 1979 around villages in Catalonia. This event was the starting point for the group's creative process over the following ten years. In October 1989 Marcel.lí left the Fura to commence his solo career. 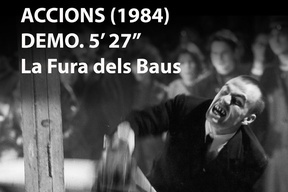 ACCIONS, 1984. Performance. A sequence of seven "actions" employing intense dramatic spectacle and music. The performance happens at ground level among the spectators and only the musicians and the high wires are raised. The performance space, usually a deserted warehouse, is used to the utmost dramatic effect. 1 MIRA. Saxophone, voice and synthesizers create an exhilarating start to the performance. 2 HOMES DE FANG. Three men, naked and caked in mud, make their way among the crowd. They eat raw eggs, smearing them over their faces and then crawl into barrels. 3 FAKIRS. Two men in suits knock down a wall and wreck a car with axes and sledgehammers; fireworks speed along overhead wires. 4 HOME BLANC. 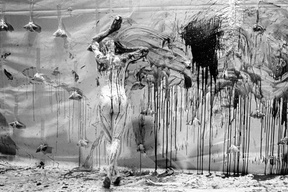 A man wearing buskins and covered with white paste moves towards a large white canvas cloth hanging on one of the walls. 5 BIPS. The men in the car cover two mud men with blue and black paint and then chase them among the audience throwing noodles at them. 6 CORDES. Two men hang from a pair of ropes and make their way towards the big canvas. Their bodies are covered with transparent plastic and they burst bags of red paint creating a red explosion. 7 LONA. The plastic men and the white man perform a body painting action on the big canvas, flailing their limbs erratically so that the canvas is daubed with red paint. SUZ/O/SUZ, 1985. Multidisciplinary dramatic performance performed at ground level, among the audience, and also on raised stages. It features mobile mechanical devices such as trolleys and rolling water tanks as well as electromechanical sound machines (Automatics). 1 AUTOMATICS Six electromechanical machines called Automatics are situated around the perimeter of the performance space and they create a musical concert. 2 IRRUPCIO Eight performers slide down ropes to the ground and start to dance through the audience with supermarket trolleys, running engines, empty drums, and a bottle of gas. 3 AJOE Musical concert. 4 COMBAT Two men standing inside trolleys are pushed by two performers among the audience. They are eating raw guts and drinking wine. They then have a fight with flour bombs and smear their bodies with blood. 5 PISCINES Two acolytes submerged in giant transparent water tanks are manipulated and taken out of their fetal container by their masters. 6 ULELE A liquid celebration by all the performers takes place among the audience with buckets, trolleys and rolling water tanks. 7 PENCAS Initiatory rite using liquids, dyes, flour, straw and food on the bodies of the acolytes, who are hanging from two towers or "pencas", Coda by the Automatics. TIER MON, 1988. Multidisciplinary dramatic performance performed at ground level, among the audience, and also on fixed and rolling stages. The musicians play on four towers situated in the four corners of the performance space. 1 ROBOTS The audience enter the performing space while the MIDI controlled electrorobots create a musical concert. 2 INICI A figure dressed in white appears from the centre of a mechanical flower, the petals of which are wooden boxes that revolve around a circular container full of water. Presentation of the characters on different stages and from inside the wooden boxes. 3 BATALLA A battle at ground level between the two opposing groups led by their leaders, In'til and Enano, using tyres, mechanical devices, fireworks and flour. 4 EXODO Exodus of the victims, with the lights dimmed, bearing with them all the props including the water container. 5 PERTIGAS Death on poles of the survivors. 6 MENJADORA A train collects the reborn and the food giver feeds them, as if they were animals. 7 GRUAS Two big cranes move dancelike among the audience, lifting the performers up to 5 metres high. 8 RITUAL The white character orders Enano and In'til to be killed in a blood bath.